Google wants to turn your Web browser into an all-purpose application. As if e-mail, word processing, spreadsheets, and scheduling weren’t enough, you can now also create presentations without leaving your browser, thanks to Google Presentations. I took a look at the other Google Web applications—Docs, Spreadsheets, Calendar, and Gmail—in The Google Office. Since that article was published, Google added the Presentations app to its Web-based productivity suite. Here’s a look at what you can expect from this Web-based counterpoint to PowerPoint and Keynote. As with Google Docs and Spreadsheets, Presentations does not yet work in Safari—at least not Safari 2. Safari 3 offers partial support, and Google says it’s working on full support for Apple’s browser. In the meantime, you can use a Mozilla-based browser, such as Firefox or Camino. By signing up for Docs & Spreadsheets with a Gmail account or other Google account, you automatically get access to Presentations as well. 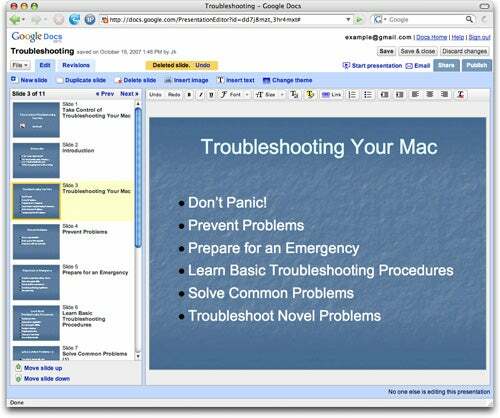 Google Presentations puts a basic presentation editor right in your Web browser window. The layout of the Presentations window approximates that of PowerPoint or Keynote: a scrolling list of slide thumbnails on the left, with the main editing area on the right; formatting controls are on the toolbar at the top. If you’ve ever created a presentation in another program, most of the controls in Presentations should be self-explanatory. And if you’ve never used another presentation application before, you can pick up the basics of Presentations in minutes. Getting Started To create a new presentation from the main Google Docs page, choose Presentation from the pop-up New menu. Once in Presentations, you can do the same thing by choosing New from the pop-up File menu. You can also import an existing PowerPoint (.ppt) presentation—though not a Keynote presentation—by choosing File -> Upload a File from the pop-up menu. Like Google Docs word processor, Presentations also lets you e-mail documents to a special address to import them. Editing a Presentation Presentations offers a basic selection of text formatting controls: Choose among six fonts, 14 sizes, and four styles (bold, italic, and underline, in addition to plain), plus a limited palette of foreground and background colors. You can add clickable links to any text, adjust indents and alignment, and create bulleted or numbered lists. Add a graphic by clicking on the Insert Image link. You can move or resize graphics and text boxes by clicking and dragging, or nudge them using the arrow keys on your keyboard. To move an image or text box forward or backward, right-click (or Control-click) on it and choose the appropriate command from the contextual menu. By clicking on the Change Theme link, you can choose among any of 15 preset combinations of background graphics, fonts, and colors. Backgrounds from imported PowerPoint presentations generally appear approximately as you’d expect, but the only other way to use a custom background image is to place the image manually on each slide. You can add a slide by clicking on New Slide and choosing any of five standard slide layouts. After selecting an existing slide in the list, you can change its position by clicking on Move Slide Up or Move Slide Down; other links let you delete or duplicate slides. Saving and Exporting As you work on your document, Presentations automatically saves it periodically in your Google Apps storage space; you can also click on Save at any time to save immediately. Exporting presentations, however, is quite limited: if you choose File -> Save as Zip, Presentations downloads to your computer a .zip archive containing your presentation as a series of linked HTML files. Those files also require a Mozilla-compatible browser for display. Printing directly from Presentations is supported, albeit with limited control over print settings. Revisions and Collaboration Unlike PowerPoint and Keynote, Presentations lets you return to any previously saved version of your document; each version is listed on the Revisions tab. Currently, however, there’s no way to compare revisions or see precisely what’s changed. Presentations also includes collaboration features; as in Docs and Spreadsheets, you can click on Share to invite others to view the presentation online or even make changes in real time. If you want to make your finished presentation available to anyone on the Internet, click on Publish and then on Publish Document; Presentations then gives you a URL that anyone with a supported browser can use to view the presentation. Showing a Presentation When you’re ready to present your slide show, click on Start Presentation. A new window appears, zooming out almost to the full height and width of your display, though Presentations doesn’t cover your Dock or menu bar. You step through slides by clicking on arrow buttons or using the arrow keys on your keyboard. A collapsible pane on the right side of the window shows any other people currently viewing your presentation online. You can participate in a live chat with your audience by typing in the field at the bottom of that pane; the chat transcript appears above it. If you’re used to PowerPoint or Keynote, you’re bound to feel Presentations has a long list of missing features. It offers no animations of any kind, including transitions between slides and sequential display of text boxes within a slide. There’s no outline mode; no charts, tables, borders, or drawing tools; no custom bullets; no area for presenters’ notes; and no on-screen timer or other presentation aids. And you can’t make your presentation fill the entire screen, meaning there will always be at least some potentially distracting on-screen elements. Presentations is ideal for storing an emergency backup of your PowerPoint presentations—even if your laptop is stolen on your way to a big meeting and no one else has PowerPoint, you’ll still be able to give at least a rudimentary version of your presentation. It’s also an easy way for multiple people to collaborate on a quick-and-dirty presentation. And it’s a convenient, low-bandwidth method to share a presentation (or even present it interactively) over the Internet. But make no mistake about it: in its initial version, Presentations is extremely light on features, and won’t replace PowerPoint or Keynote for the serious presenter any time soon.